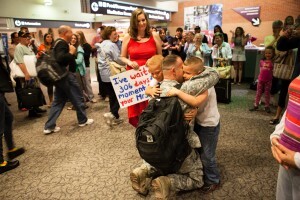 This is Part 1 of the Military Homecomings are a Process; Not an Event blog. Read Part 2 here. At the end of June, my husband arrived home from a 10-month deployment to Kuwait. I started writing a blog to commemorate his return, but more importantly to provide insight to the reintegration process that military families face post-deployment. I stopped writing the blog because I found that it was overwhelmingly negative. Prior to my husband’s homecoming, I attended a Yellow Ribbon Reintegration Program event. We were instructed to remember that “homecoming is a process, not an event.” Reflecting on the last 5 months, I realize that this was the best advice that I received regarding the reintegration process. Of course, I was happy that my husband was home. We had just gone through a 10-month separation. We had spent every holiday apart for the first time in our 4-year relationship. We had moved our wedding up by 2.5 months to accommodate his deployment. He left 3 weeks after our wedding. We never got to be newlyweds. We opted for a family vacation with my two stepsons in lieu of a romantic honeymoon. Yes, I was happy that my husband was home. But I couldn’t help but get a little pit in my stomach when people would say such things. A twinge of guilt perhaps. Yes, I was happy that my husband was home, but I was also completely overwhelmed. My life had evolved so much while he was overseas and I was terrified at the prospect of blending the life we had lived before he deployed and the life I had built while he was gone. When he left in August of 2013, it took about 3 months for me to adjust and for life to stabilize. When he left, I was a full-time Ph.D. student with a relatively flexible schedule. When he came home, I had taken a full-time position. We had moved 2 weeks before he deployed, so that I could be closer to school and friends while he was gone. Prior to him leaving, we were a commuter couple in an area that offered little in terms of a support network. I had moved into a beautiful apartment that I loved. I had made an entirely new group of friends at my work. I had gotten into a routine that included work, school, the gym, and social events. I had continued to take my stepsons 1 or 2 weekends a month, but given the distance between myself and them, I would travel to their hometown and stay with my in-laws. With the exception of the winter break from school, I had not had them in our new home. For all intents and purposes, our apartment was my domain. I picked up my stepsons the morning that Chris was expected to fly home. They were on summer vacation and we were keeping them for the next month. The homecoming itself was chaotic. Chris’s original flight was canceled, pushing his arrival back into the evening. I ordered a pizza that was never delivered. So, instead I took the boys out for dinner close to the airport. I then learned Chris’s flight was delayed. We went to the airport anyway, only to have his flight become more and more delayed. There was no information on the arrival monitor, except that the flight was delayed. We were now pushing upon a chance of Chris not being able to fly home that day, as the flight crew would soon time out, if they didn’t get the plane in the air. It was after midnight by the time his flight arrived. My stepsons had fallen asleep on the airport benches. I was emotionally drained. I was disappointed that my vision for his homecoming, complete with painted signs, handmade t-shirts, wine, and a cheese platter was not going to come to fruition. Chris was almost the very last passenger to come through the gate. As soon as we embraced, I started crying. I was so happy that he was home, but I was also finally able to release all of the emotions that I had been holding in as the day unfolded. I now realize that it was also all of the emotions that military spouses suppress during a deployment. We tell ourselves that we are “Army Strong” and we just push through whatever obstacles present themselves. There were many small things over the next couple of weeks that we were able to laugh about. Chris walking through our apartment, asking where the light switches were in whichever room he was in. “Where are the cups?” he asked. “In the cabinet above the coffee maker,” I responded. “Where the heck is the coffee maker?” he mumbled to himself frustrated. The first time he made the bed after returning home, the bedspread was facing the wrong way. I couldn’t help but laugh. These things served as comic relief to the larger challenges. I was completely overwhelmed. The boys constantly wanted to be with their father, understandably, but I also wanted quality time with him. The boys had been so accustomed to deferring to me for the last 10 months, that even when they were sitting right next to their father, they would ask me to do stuff for them. I was catering to their needs, while also helping Chris acclimate. How do you work the Keurig? How do I get to the mall? The first time we went to the grocery store after he got home, he wouldn’t leave my side. “What kind of fruit do you want?” I asked. “Whatever you want is fine.” He was overwhelmed. He hadn’t had to think about groceries for 10 months. “Just pick something,” I encouraged him. He settled on a container of sliced pineapple. “It’s less expensive to buy a pineapple and slice it, then to buy pre-sliced pineapple,” I nagged. Oops. I had just told him to get whatever he wanted and then when he did, I criticized him. “I’m sorry. It’s fine. Let’s get this pineapple.” He wouldn’t drive over 20-25 miles per hour, which grated on my nerves. I was still handling all of the household affairs like I had to do while he was gone. We had travel plans for later in the month, so I wasn’t able to take any time off right when he got home. I now went to work and came right home to cater to my family. The family that just a week earlier hadn’t existed as it did now. I wasn’t getting to the gym anymore. No more impromptu after work happy hours with my friends. I had to compete with others to watch what I wanted on TV. The bathroom floor would be soaked by the kids when I was getting ready in the morning. I was feeling incredibly defensive of my independence and my new friendships. I hadn’t quite figured out how to mesh the two lives together. I realize how trivial these things sound, but I felt in a constant state of being overwhelmed and confused by my feelings. I would get angry and blame myself. Why am I not overwhelmingly happy? Why am I not having that Hollywood experience where my husband would return and we would pick up right where we left off? What is wrong with me? I was pulling away from my family. I was pulling away from Chris as I struggled to blend what felt like two entirely different lives. I was hurting him. I didn’t mean to hurt him. I was making him feel that I liked life better while he was deployed than when he was home. I was making him nervous about our future. I was making myself nervous as I tried to get a handle on things. Would our family be able to recover from this deployment? How would we get our relationship back on track? How would we get our family back on track? All I could think was, “What if Chris had been in combat this tour and he came home with PTSD or other invisible injuries?” How fortunate we are that he didn’t, and yet I still felt like I was failing at the reintegration process. How do other Army families do it? Are other military spouses stronger than me? Thank you for this post! My husband is about to return from his first deployment. We don’t have kids but our lives have completely changed since he left – our house sold, we moved states, and are staying with my parents until he is back so we can find our own place. Can you provide more details about the actual arrival? We are both unsure of the process. I keep hearing about a formation, but your post said you saw him immediately after the flight. Then what? Did he get to come home with you or did he have to go with his unit to base? I was unable to attend the Yellow Ribbon event during the deployment to ask these questions. Thank you!